Male lark buntings (above) compete to mate with females (below) whose preferences change from year to year. Top photo by Bruce Lyon, bottom photo by Alexis Chaine. A study of how female lark buntings choose their mates, published this week in Science, adds a surprising new twist to the evolutionary theory of sexual selection. Researchers at the University of California, Santa Cruz, discovered that female lark buntings show strong preferences for certain traits in the males, but those preferences change from year to year. Classic examples of sexual selection involve elaborate ornaments, such as the peacock's tail, that evolve as a result of consistent female preferences, so that males with the most exaggerated traits have the most success mating and produce more offspring than less flamboyant competitors. 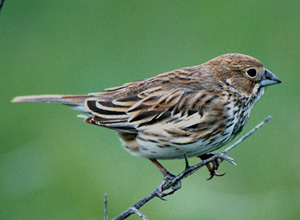 In the case of lark buntings, however, the flexibility shown by females in choosing their mates dampens the trend toward more elaborate ornamentation and may instead maintain variability in male plumage. "It's counter to the conventional view of female choice as static," said Bruce Lyon, associate professor of ecology and evolutionary biology at UCSC and coauthor of the paper. "These females are capable of very sophisticated behavior, and they appear to benefit from their flexibility in mate choice by gaining enhanced nesting success." The study suggests that the male's plumage somehow serves as a signal to the female that he possesses certain traits that will affect the pair's nesting success. Shifting environmental conditions may determine which male traits matter most in any given year, said Alexis Chaine, who worked on the study as a UCSC graduate student and is now a postdoctoral researcher at the Centre National de la Recherche Scientifique (National Center for Scientific Research) in France. Chaine is first author of the paper, which appears in the January 25 issue of Science. "The traits the female is choosing somehow predict how successful the pair will be in nesting," Chaine said. "One possibility is that certain traits are associated with the male being a good forager, and other traits predict how well he could defend the nest from predators. So, if there are lots of ground squirrels, which are a major nest predator, she wants a good defender, but in a year when grasshopper populations are low, she needs a good provider. These are ideas we still need to test." With a mostly black body and bright white wing patches, the male lark bunting is a distinctive bird of the Great Plains. Females choose a new mate every year, and parenting duties are shared by both members of the pair. The males are territorial during the breeding season, flying up over their territory and singing as they descend to attract a mate. Once they acquire a mate, however, they no longer defend the territory. The researchers found no correlation between the quality of a male's territory and his success in attracting a mate. The white wing patches and other male plumage traits serve as signals in aggressive interactions between territorial males, Chaine said, meaning that female mate choice is not the only factor influencing those traits. But the researchers found that the role of those signals in competitive interactions between males was consistent from year to year. The level of aggression didn't vary between years either. "Male competition can't explain the overall pattern, but it may be an important factor in the evolution of male plumage traits," Chaine said. The variability of the male plumage was one of the first things Lyon noticed when he began studying lark buntings on the Pawnee National Grasslands in Colorado. 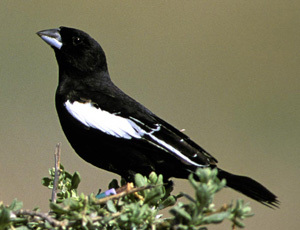 (The lark bunting is the state bird of Colorado.) Chaine joined Lyon the following year and began an exhaustive long-term study, gathering data from 1999 to 2003. "We had to conduct studies every year over several years before we could see what was going on," Lyon said. "We saw two patterns of variation in the correlations between male traits and female mate choice. In some cases, it was either on or off--a trait was important to females one year and not important in other years. We also saw reversals--for example, one year the females preferred males with bigger wing patches, and the next year they preferred smaller wing patches." Lyon cautioned that additional experiments are needed to provide definitive evidence of female preferences. The study was based on statistical correlations, which provide clear evidence that the traits of mated males differ from those of males without mates. "We suspect it's because females are choosing males with particular traits," Lyon said. "Ideally, we would like to test that with field experiments." The dynamic sexual selection seen in lark buntings is probably occurring in other species as well, he added. That has implications for theoretical models of how sexual selection influences the evolution of male traits. "The assumption that sexual selection is static is something we've all taken for granted," Chaine said. "This study might cause some people to rethink their systems and take another look at their data." This research was supported by grants from the National Geographic Society, National Science Foundation, American Museum of Natural History, Sigma Xi, and the American Ornithologist's Union. Note to reporters: You may contact Lyon at (831) 459-3949 or lyon@biology.ucsc.edu and Chaine at alexis.chaine@ecoex-moulis.cnrs.fr.